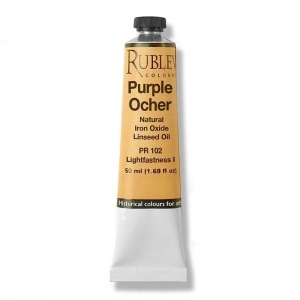 Rublev Colours Purple Ocher is a semi-opaque deep bluish red with cool undertones, medium grained, average tinting strength and brushes "long" in the direction of the brush stroke. Our purple earth comes from quarries in the Lori province of Armenia. It harmonizes perfectly with other earth colors of Rublev Colours Artist Oils, and is impossible to reproduce by mixing other colors. 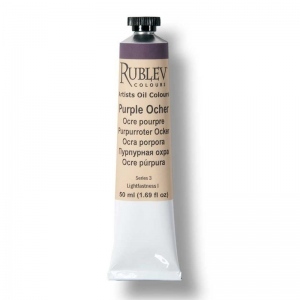 This month, we added Rublev Colours Purple Ocher Artist Oil, which has a deep red masstone and subdued purple tints. It is workable paste color ground in linseed oil that has a moderate to low oil content and long, slightly thixotropic body. 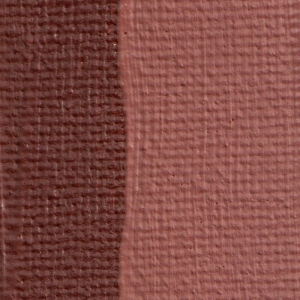 Being a iron oxide it is absolutely lightfast and is compatible with almost all other pigments on the palette. Rublev Colours Purple Ocher mixed with black or blue it furnishes grays and chocolates and is most invaluable in neutralizing greens. We believe it will not only make a wonderful addition to any palette, but become a principal color in creating cool tints in flesh tones and landscapes.